P = pole(sys) returns the poles of the SISO or MIMO dynamic system model sys. The output is expressed as the reciprocal of the time units specified in sys.TimeUnit. The poles of a dynamic system determine the stability and response of the system. In continuous-time, all the poles of the transfer function have negative real parts. When the poles are visualized on the complex s-plane, then they must all lie in the left-half plane (LHP) to ensure stability. In discrete-time, all the poles must have a magnitude strictly smaller than one, that is they must all lie inside the unit circle. P = pole(sys,J1,...,JN) returns the poles P of the entries in model array sys with subscripts (J1,...,JN). For stable discrete systems, all their poles must have a magnitude strictly smaller than one, that is they must all lie inside the unit circle. The poles in this example are a pair of complex conjugates, and lie inside the unit circle. Hence, the system sys is stable. For stable continuous systems, all their poles must have negative real parts. sys is stable since the poles are negative, that is, they lie in the left half of the complex plane. For this example, load invertedPendulumArray.mat, which contains a 3-by-3 array of inverted pendulum models. The mass of the pendulum varies as you move from model to model along a single column of sys, and the length of the pendulum varies as you move along a single row. The mass values used are 100g, 200g and 300g, and the pendulum lengths used are 3m, 2m and 1m respectively. Find poles of the model array. P(:,:,2,1) corresponds to the poles of the model with 200g pendulum weight and 3m length. If sys is a generalized state-space model genss or an uncertain state-space model uss, pole returns the poles of the current or nominal value of sys. If sys is an array of models, pole returns the poles of the model corresponding to its subscript J1,...,JN in sys. For more information on model arrays, see Model Arrays. Indices of models in array whose poles you want to extract, specified as a positive integer. You can provide as many indices as there are array dimensions in sys. For example, if sys is a 4-by-5 array of dynamic system models, the following command extracts the poles for entry (2,3) in the array. P is expressed as the reciprocal of the time units specified in sys.TimeUnit. For example, pole is expressed in 1/minute if sys.TimeUnit = 'minutes'. For state-space models, the poles are the eigenvalues of the A matrix, or the generalized eigenvalues of A – λE in the descriptor case. For SISO transfer functions or zero-pole-gain models, the poles are the denominator roots. For more information, see roots. For MIMO transfer functions (or zero-pole-gain models), the poles are returned as the union of the poles for each SISO entry. If some I/O pairs have a common denominator, the roots of such I/O pair denominator are counted only once. where ε is the relative machine precision (eps). For more information on multiple poles, see Sensitivity of Multiple Roots. If sys has internal delays, poles are obtained by first setting all internal delays to zero so that the system has a finite number of poles, thereby creating a zero-order Padé approximation. For some systems, setting delays to zero creates singular algebraic loops, which result in either improper or ill-defined, zero-delay approximations. For these systems, pole returns an error. 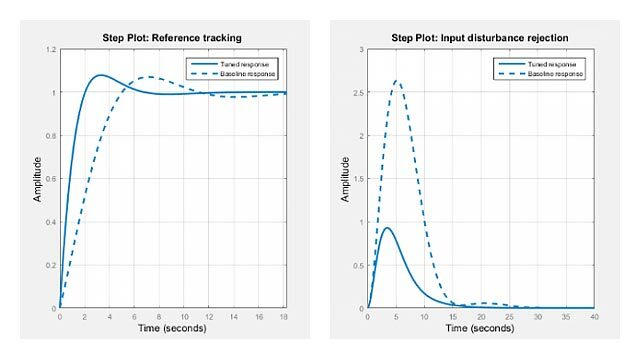 To assess the stability of models with internal delays, use step or impulse.